There’s a woman who so regularly walks on the street beyond my desk that a part of me sees her as a colleague. When she passes she seems focused, on her way to do something specific. We’ve never spoken and have only occasionally, briefly (and curiously) locked eyes. I have no idea where she’s going to (or from), nor why. But somehow I’ve felt the need to construct a story about her – and in doing so, to psychologically bring her into my working group (albeit a part of some other ‘department’ in my ‘organisation’). Sure, I’m curious about other people (aren’t all writers? ), but I reckon the driving force behind this projection is that I’m a lone (not lonely) freelancer. Just passing by my window brings her into my office. Sometimes I wonder what it would be like to work in a writing bull pit – maybe not a newsroom per-se, but perhaps for a magazine. No doubt all the annoyances of shared working environments would be there (office politics, smelly lunches, interruptions, noise). But there would also be that sharing of daily challenges and experiences, that opportunity to learn oodles from those around me. Windows to craft within easy reach. My copies of Stein, Blundell and Hart (an e-book but also available in print). Clearly, on one level I feel isolated enough to project some kind of inclusion on a complete stranger who walks past my window. But I do get daily access to great minds – stalwarts of the international writing community. The truth is, I’m pretty good at reaching out – I simply lift up my hand, stretch out my arm and grasp. There I find the three tomes on writing that influence just about every assignment I undertake. 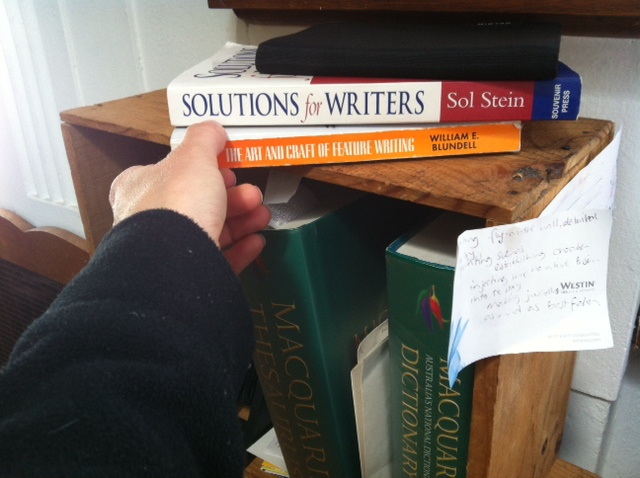 One of my longest standing mentors has been the great editor (and writer) Sol Stein in his book Solutions for writers: Practical craft techniques for fiction and nonfiction (my copy from Souvenir Press, 2006*). The title says it all: solutions, writers, practical, craft, techniques, fiction and non-fiction. Likewise the title chapters… my favourites include Using the techniques of fiction to enhance non-fiction as well as Liposuctioning flab and Conflict, suspense and tension in non-fiction. Stein’s book has chapters on story, plot, character, dialogue, tension and point of view. Many include checklists (and where they don’t I’ve made my own). I often apply these to my words before I submit. They can flag the obvious and often overlooked – such as ‘Find and delete all the verys and quites that crept into your first draft,' but Stein also poses questions to help improve the story overall. On suspense for example he asks, ‘Can you convert any sentence to a question that will arouse curiosity rather than satisfy it?’ Hmmm, can I? Sound familiar? Blundell’s book includes chapters on shaping ideas, story dimensions, organisation and editing. But the resources I return to again and again are his Noodling around checklists. In them Blundell poses questions to help get to the heart of a story (before writing and even researching). It prompts you to consider your story through questions of history, scope, reason, impact, countermoves and futures. Once you’ve answered all those questions you’ll have a pretty good idea of what your story is about (and what research is missing). And that’s just one chapter (Planning and Execution) of its 200+ pages. Despite the help that Stein and Blundell have given me, until recently I have struggled with the concept of plot (admittedly in both fiction and non-fiction). Of all the events that unfold in a story which ones do I choose? Sometimes these are obvious, but other times they’re less easy to find. Earlier this year I finally understood it – thanks to Jack Hart in his book, Storycraft (my e-copy by University of Chicago Press, 2011). Hart articulates the connections between events, complications, conflict, resolution, desire, story and plot. My favourite part of Hart’s book is where he draws a narrative arc and explains how to populate it with scenes, episodes, questions, turning points and the story climax. With this the events from my research can finally be shaped into an engaging plot. So it is: the life of the freelance writer. For experience and advice we turn to great writers. As for a sense of companionship? Well… there’s always the people walking by our windows.